We want to give an update of how Brennan’s Tree Service has been making out this spring. The storms have been many and the damage they have caused has kept us busy to say the least. It all start with those late winter snow storms. Trees collapsing on cars, homes and yards all over the area. 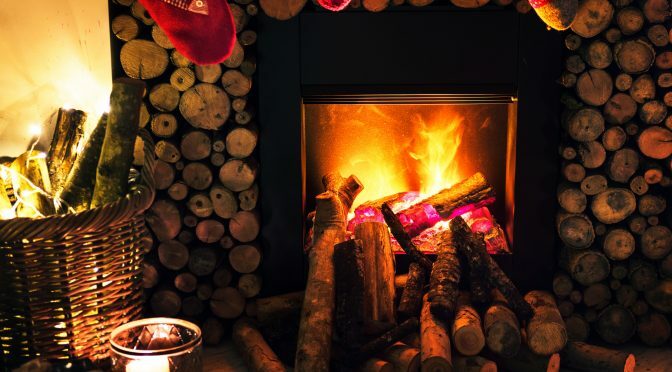 We have had to remove limbs from living rooms where they have snapped off with the wet, frozen weather and when they hang over a home, gravity, plus the weight brings them crashing down and wreaking havoc on anything in the way. Our calls have been from past customers, friends, family and new customers. 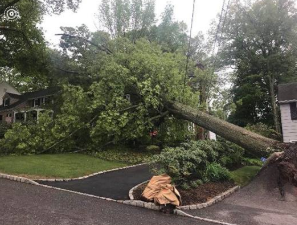 Towns like Livingston, Millburn, West Orange, South Orange and Montclair we saw the most tree damage, plus several other towns too. Although we try to serve as many people as we can, when these storms hit, the phone is busy, yet we are busier in the field and can only do what time, conditions and man power allow. For those people who called and we couldn’t handle the work load at that time, we apologize. 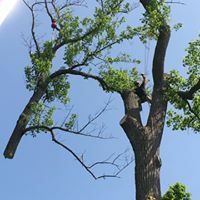 The best way to handle emergency tree service is to have any and all problem trees, limbs and branches pruned back or cut down prior to a storm. An ounce of prevention is a pound of cure as the old saying goes. 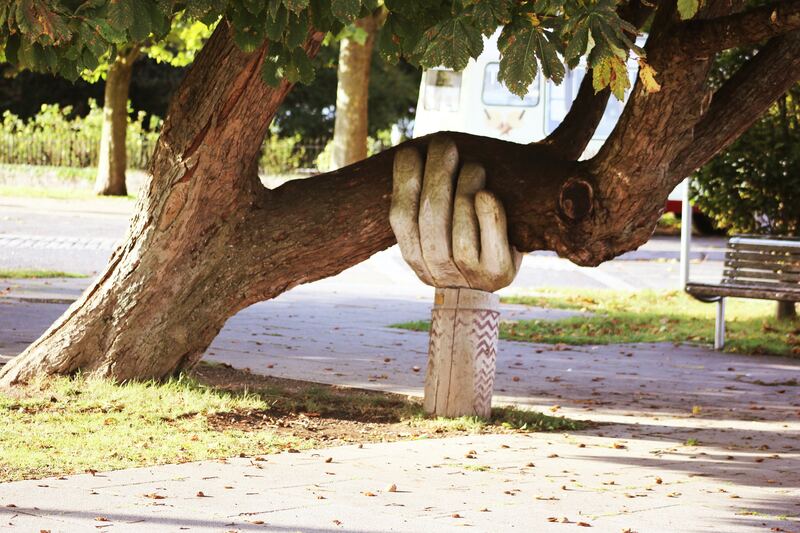 Not sure about the safety of your trees, branches or limbs? Give us a call, we would be more than happy to prevent a disaster on your home, car or property. Leave us a comment here and make sure to like follow and share on Facebook. 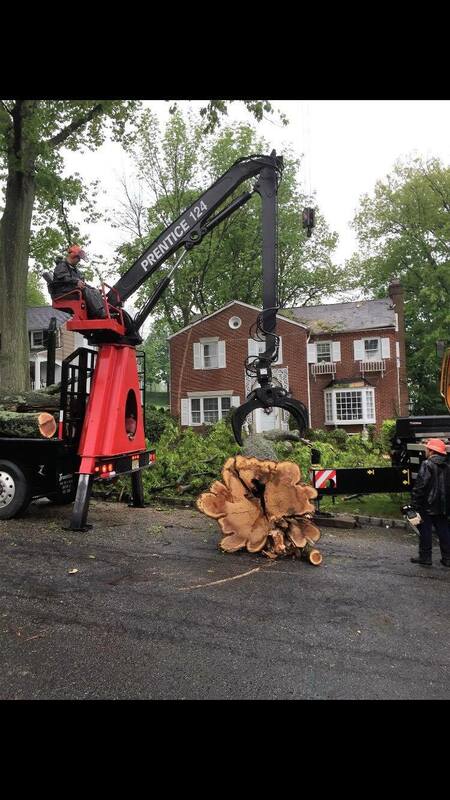 Storm Damage and NJ Tree Services. 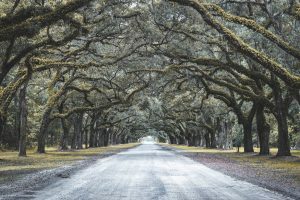 Most tree care professionals will probably disagree with this assessment—a great deal of the work done on landscape trees is undertaken with the weather in mind. 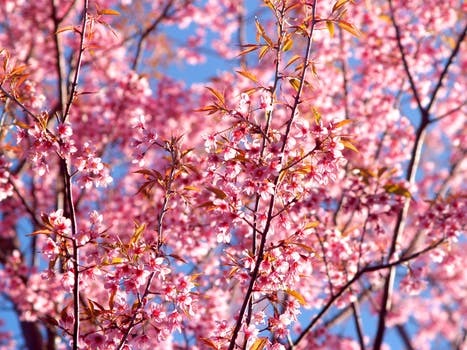 For example, tasks like trimming, pruning and removal work to combat the effects of wind and snow; planting the right species for the local climate; creating shade to keep homes cool; the list goes on. 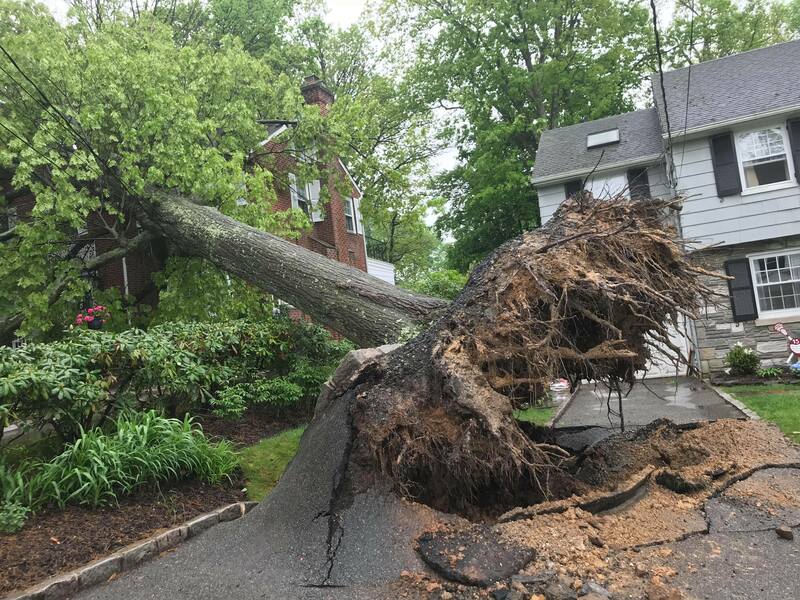 And when stormy weather strikes, it’s tree care companies that are often the first call made by property owners to come in and make things right. 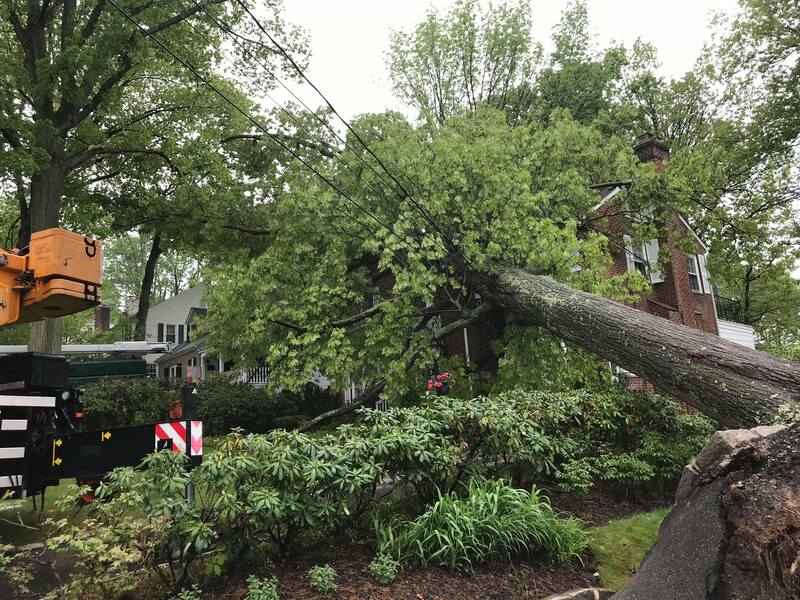 “During a storm, trees can end up anywhere—on a building, on a car, on power lines,” says Eugene Brennan of Brennan’s Tree Service, based out of Vauxhall, NJ. 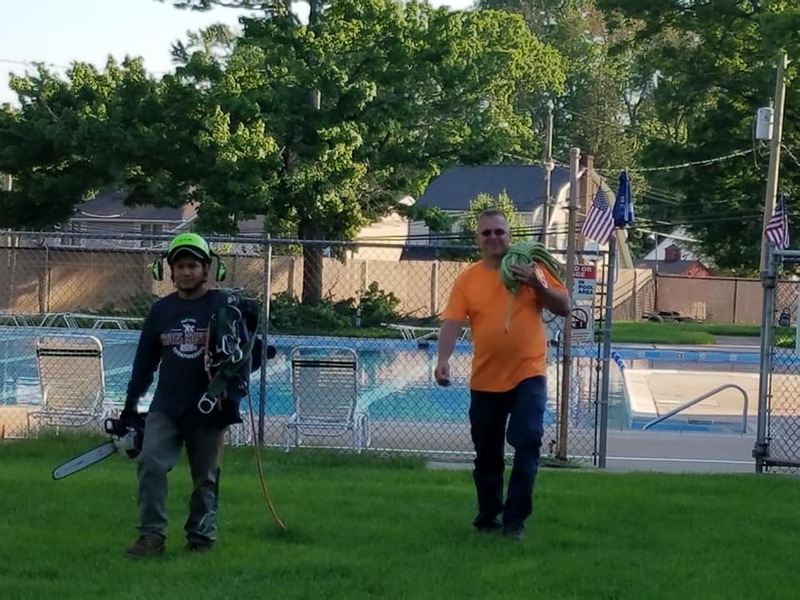 With over three decades in the tree care business, Eugene says he’s developed a pretty effective system for prioritizing calls that come in to the office. 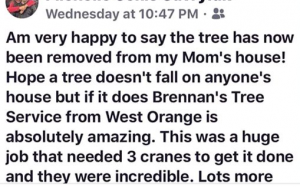 The staff at Brennan’s Tree Service follows a protocol to ask for specific information that will help them determine how a particular storm cleanup call should be prioritized (existing customers always top the list). Thanks to smartphones, the ability to receive visuals from customers instantly has proven very handy. Eugene, says customers can send him images via smartphone so he can put priority and safety issues at the top of the to do list. 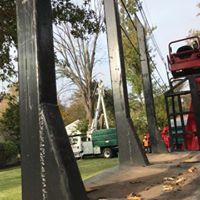 Eugene scouts to assess the drivability of various job sites, hoping to prevent a situation where a large truck, or piece of equipment, and ends up unable to get through. 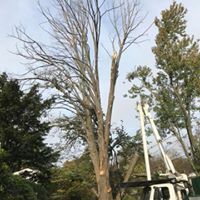 Brennan’s Tree Service conducts a pre-storm plan, where the crews are on notice and equipment is prepared ahead of the storm and the calls coming into to do many of the various storm damage tree removals. With the Essex, Union and Morris county area being densely populated, housing is closely developed and a big tree can have an impact on several homeowners at once. Brennan’s tree removal crews are on call and work long hours, sometimes for weeks to clean up after a storm rips through the area. Removing a tree from a front or backyard is a lot easier then removing a big silver maple or red oak from on top a house or building. 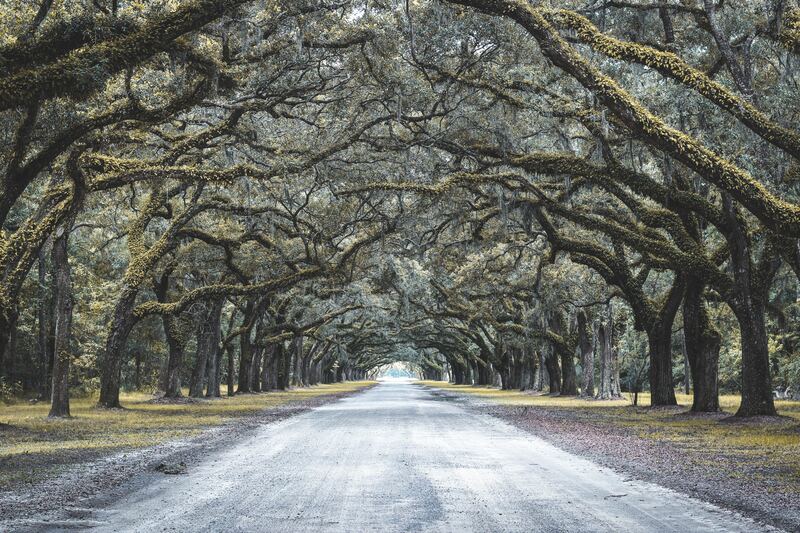 With more stress points, plus being careful not to do more damage to the property, care must be taken so limbs don’t snap back, puncture roofs, windows or worse have a heavy trunk crush a wall or snap the roof framing. The trunks of a large tree are weighted in tons not pounds. With downed electric wires and cables wrapped in the limbs, crew safety and shock hazards must me taken into account. 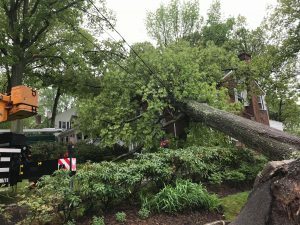 If needed, the electric company needs to be notified and Brennan’s Tree Service, lets them assess the danger and works with the power companies to remove trees and limbs to restore power and cable. 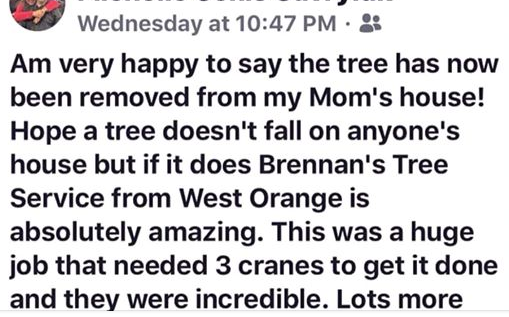 Brennan’s Tree Service does not travel outside their normal coverage area to “chase” storm work—meaning that after a storm event, it’s often their own existing customers who they’re working with. Many time’s these are people who have suffered destruction to their homes and properties, so working with them means more than cleaning up the trees and branches. 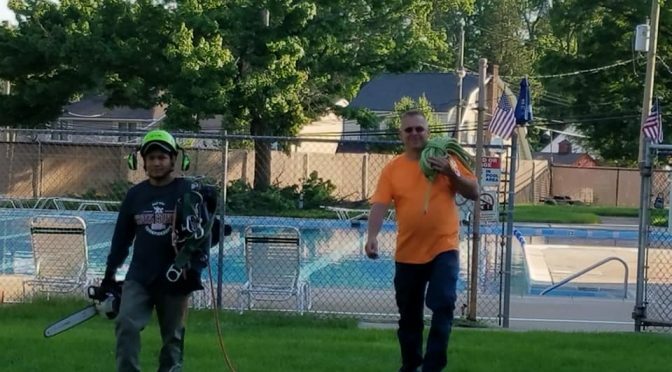 Brennan’s Tree Service, serves the Short Hills, Montclair, West Orange, Summit, Mountainside, Irvington, Caldwell, Union, Madison, Scotch Plains, Berkley Heights and surrounding communities. “Usually with storm work, you have to work with the insurance companies—understanding who pays, and how you get paid,” says Eugene. He adds he often has to assist the homeowner in communicating with their insurance company. And storm cleanup isn’t something that occurs only after large “named” storms that make the news. “A couple of Friday’s ago we had a very windy day.” A couple of emergency calls came in, then some more, and eventually two of the company’s crews were brought in to respond. 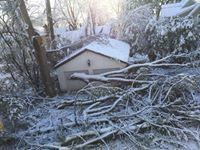 Sometimes, Eugene adds, it’s something as simple as a summer thunderstorm, heavy wet spring snow or winter ice event that causes tree damage that needs to be cleaned up. Because talking about the weather is one thing, but when you’re in the tree business, people want you to do something about it. Brennan’s Tree Service is available for all your tree care needs. 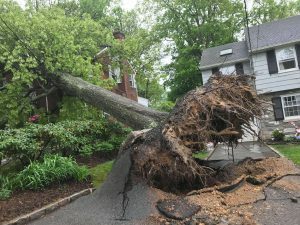 We offer pre-storm assessments and trimmings, to post storm clean-ups. 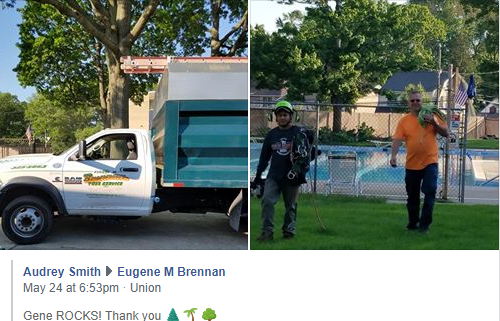 Brennan’s Tree Service a trusted tree care service, serving Essex, Union and Morris Counties of New Jersey, since 1964. Related News about the latest storms. Working near power lines is dangerous. You should always assume that the wires are live. 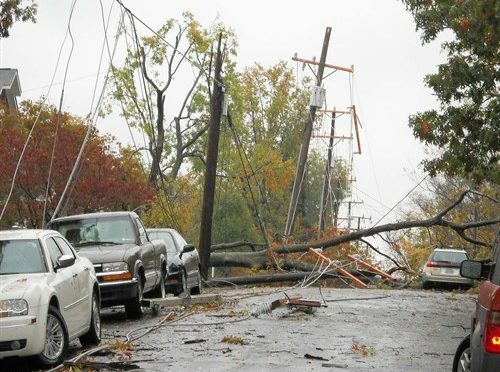 If you, your tools, or the tree hits a power line, you may knock out the power in your neighborhood – if you’re lucky. Most likely, you will be electrocuted. Another myth homeowners may believe about power lines is that the black coating on them is insulation. This is not true. The black coating on power lines is weather-proofing for the metal cable. You can still get electrocuted through the weather-proofing. Power line and tree maintenance explained here. OSHA requires tree removal professionals to wear protective gear from head to toe. Tree care professionals are also trained in using equipment such as chain saws, ropes, cranes, and wood chippers to safely fell and dispose of a tree. Homeowners would need all of this equipment – and the requisite expertise – to perform a safe removal. Without it, they expose themselves to unnecessary risk. A dead or dying tree is often decaying from the inside out, making it extremely unstable. Even professionals sometimes use cranes to remove such deadwood. 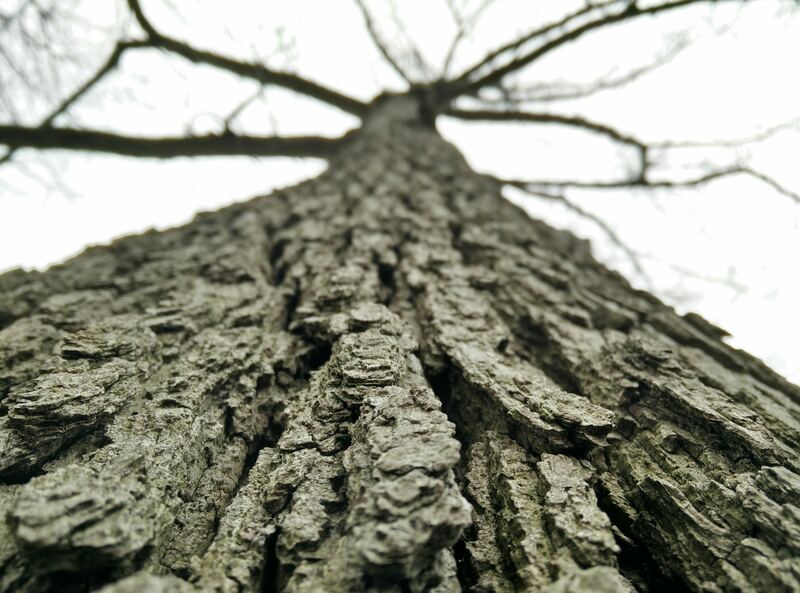 If you think your tree is starting to decay, find a professional tree care expert to remove it before it collapses. There are critical tree structure assessment processes to understand when removing decayed trees, so professional help is necessary. Once the tree starts falling, you have no control over where it goes. It also may not fall the way you expect it to, even if you try to influence it with carefully cut indentations or ropes. 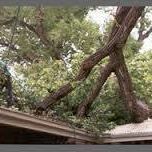 Poor judgment could result in the tree falling on property, homes, power lines, or people. 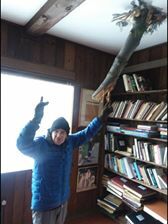 Homeowners should never attempt their own tree removal. It isn’t worth the risk, and will likely cause more problems than it solves. Will your homeowner’s insurance cover damages or injury should it happen? 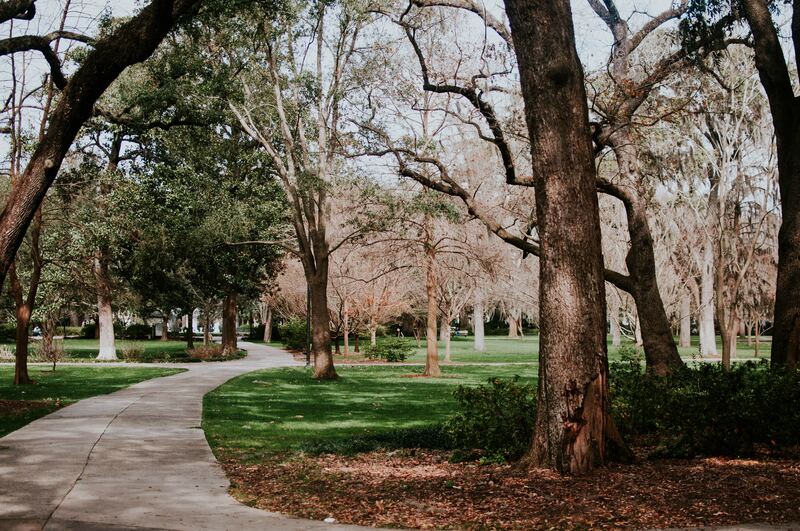 If you have a tree that needs to be removed, Call Brennan’s Tree Service and a professional tree care expert will be able to determine the best way to safely remove your tree. 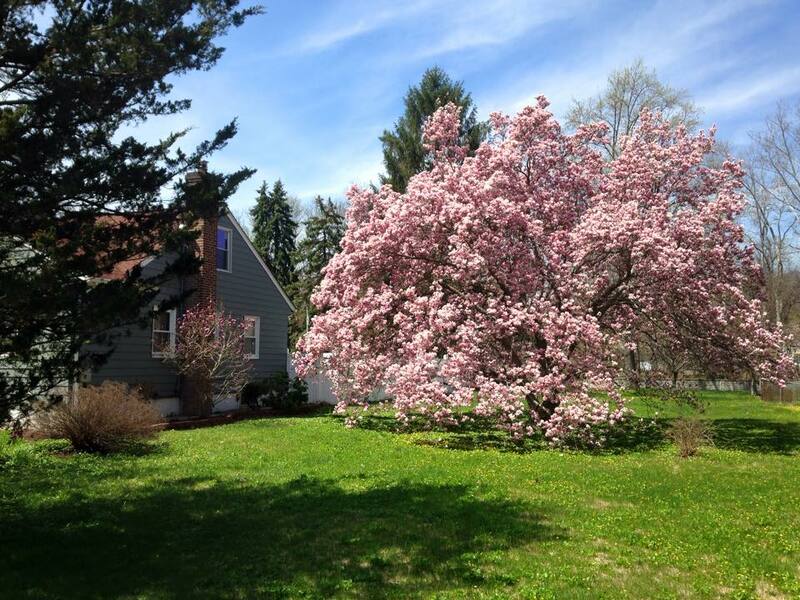 Breann’s is a licensed tree care expert with the state of NJ. Our license number is #499.